If it can be said that this year was a season of opportunity for Dartmouth baseball — as I wrote in the preseason round up so many weeks ago — then this weekend is the culmination of that opportunity, the chance to swipe the Ivy League crown from the two-time reigning champ Columbia University in the Lions’ own den. Whether or not Dartmouth will bring home the championship for the first time since 2010 is a question to be answered only by the unpredictability and fickle nature of baseball itself. Whether or not the Big Green can is a question that the team has already answered. Dartmouth has its pick of two of the Ivy League’s best pitchers to take the start for the games on Saturday — Mike Concato ’17 and Duncan Robinson ’16. Both pitchers are among the top five in conference ERA, which, in this case, is more relevant than overall ERA given the disparate levels of competition each Ivy team decides to take on outside of the conference. Robinson’s 1.31 conference ERA leaves him second only to the University of Pennsylvania’s Mike Reitcheck with 1.23 while Concato sits in fourth with 2.06. Robinson was listed in the press release on Thursday as the possible game one starter. Captain Louis Concato ’14 said he is feeling confident about the Big Green’s chances this weekend. The ideal situation for Dartmouth would be a quick, two-game sweep as the ERAs of the next best Big Green pitchers take a two-point leap. That’s not to say the series is over if it goes to a third game — Louis Concato has shown the ability to get things done on the mound in high-pressure situations. Louis Concato gave up just two earned runs to then-No. 14 — now ranked in the top five — Texas A&M University in five innings of work. But keeping the Lions at bay, no matter who is on the mound, will be a challenge that Dartmouth will have to meet if it is to break its string of bad luck in the Ivy League postseason. Columbia brings with it the most productive offense in the Ivy League, holding within its lineup the three players to cross home plate most throughout the season — Jordan Serena, Gus Craig and Joe Falcone. The three Lions alone have scored 64 conference runs, while the only Dartmouth player to lead an Ivy League offensive category is shortstop Matt Parisi ’15 with 12 doubles on the season. Dartmouth did, however, have the most explosive game of any team during the regular season in its 22-run evisceration of Yale University at the front end of its 14-game winning streak. 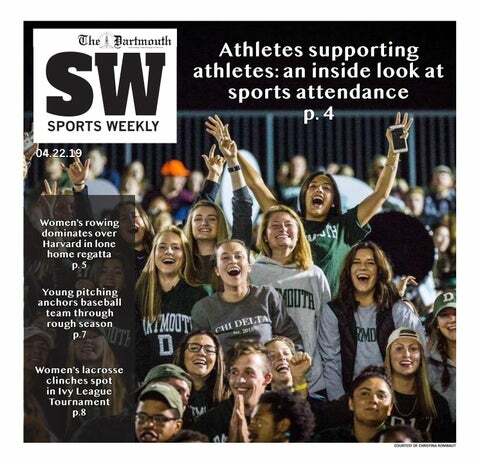 After beginning divisional play, Dartmouth did not lose a single game — conference or midweek — until the end of the regular season. While the statistics put the Big Green at an offensive disadvantage, the team’s recent activity in the batter’s box could be enough if its pitchers produce outings representative of their abilities. Besides that, the few Dartmouth batters who were producing in the early season have been joined recently by freshmen who have become increasingly comfortable at the plate, such as Kyle Holbrook ’18, who was named Ivy League Rookie of the Week on April 28 after hitting .500 across four games. The situational hitting that has been characteristic of Dartmouth over the past month, catcher Matt MacDowell ’15 said, will be critical in dismantling the Lions’ rotation. Should the series necessitate a third game, Columbia’s three likely starting pitchers — Mike Weisman, Kevin Roy and George Thanopoulos — are fifth, seventh and ninth, respectively in conference ERAs, ranging from 2.10 to 2.61. Weisman is the only Ivy League pitcher to hold opponents to a sub-.200 batting average in conference play. The last time the two faced off this season, the teams split — the win coming for Mike Concato and the loss to older brother Louis Concato, though both pitchers gave up four runs apiece. The Big Green split with all of the Lou Gehrig Division early on in the season, coming off of a particularly difficult preseason which, head coach Bob Whalen said, contributed to the team’s notoriously slow start. “You have to be ready at the beginning because those games that you play at the beginning count as much as the games at the end, but you want to be playing your best baseball at the end,” Whalen said. Going into the Ivy League Championship Series — for the third consecutive time against Columbia, who has taken Dartmouth in both the previous match-ups — the Big Green is coming off of one of its most successful stretches in program history. The team, MacDowell said, is familiar with the series, is better prepared than they have been in the past and lacks the “panic” element that prevents it from gaining the critical momentum needed to come out and take the series into its own hands. While we would like to believe that the team that takes the Ivy crown at the end of the year is always the undisputed best, the truth is that the victor, who claims a year of their own and their opponents lives, can be determined in less than half of a day. The winner will be, plain and simple, which team steps onto the diamond and plays better baseball. And to that point, as of late — despite what numbers, statistics and critics may say — Dartmouth’s own record, performance and rise through the Ivy League ranks speak that more than a writer ever could.